We had the pleasure of speaking with The Muppets producers David Hoberman and Todd Lieberman during our visit to Jim Henson Studios. They spent their time with us talking about a G vs. PG rating, their personal stories with the Muppets, bringing the Muppets to a new generation of movie-goers, and future plans for the franchise. “I think “PG” is probably where you wanna be with this kinda film because you’d like to get early teens and…you’d wanna get everybody…or…you’re gonna…get little kids and only their parents,” Hoberman said in regards to the PG rating of The Muppets. 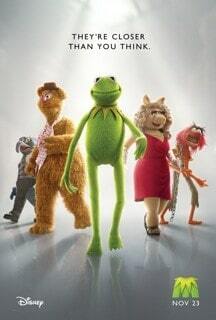 A theatrical film for the Muppets has not been done in over a decade, though Disney has owned the brand for several years. “Sometimes the timing of things just works out and there was a script being developed that Jason Segel and Nick Stoller wrote. And Jason kind of jump started the whole thing by taking a general meeting at Disney and pitched the idea as a life long fan of saying, ‘I wanna do this as a movie,’” Lieberman said of how the project came into existence. Getting the approval to make the film was actually less challenging than making the film. “There were a lot of technical challenges that we weren’t necessarily aware of, having never produced a Muppets movie before…that’s where the real lessons came in…how do you fit 10 people in a small space? How you choreograph a scene where you just have to show from here to here? How you build a set that enables Puppeteers to go there and actually show the puppets? How do you put a group of people in the real world and not show the humans and just show the puppets?” Lieberman said of the challenges that they faced.